The problem with breakfast is that it has to happen quickly for most of us. We’d love to take our time, but reality interferes. My morning routine is pretty set. I get up around four, work out for an hour, throw breakfast together and bring it in the car with me to take to work. I have absolutely no time to sit around, read the paper, and cook something. And the snooze button? Nope, never used that. It seems like a torturous concept to me. Why would you prolong getting up over and over? My kids are in a similar position when it comes to being rushed. I don’t see them in the morning because my job starts earlier than their school, but they still have to be out the door very early, and Kenny needs to keep it simple. Easy is a must! When I was growing up, I had cereal pretty much every day. It fed into my sweet cravings, but I always wound up hungry an hour later. That’s no way to live, people. After several years of messing up my breakfast choices, I learned about protein. After a workout, it’s actually ideal to eat (0r drink) a protein-fueled breakfast. It helps with muscle recovery, and it also helps keep you nice and full through a long morning at work. You can use the powder to make a smoothie, or if you’re in a hurry, Carnation Breakfast Essentials® also makes ready-to-go bottles. It’s up to you! 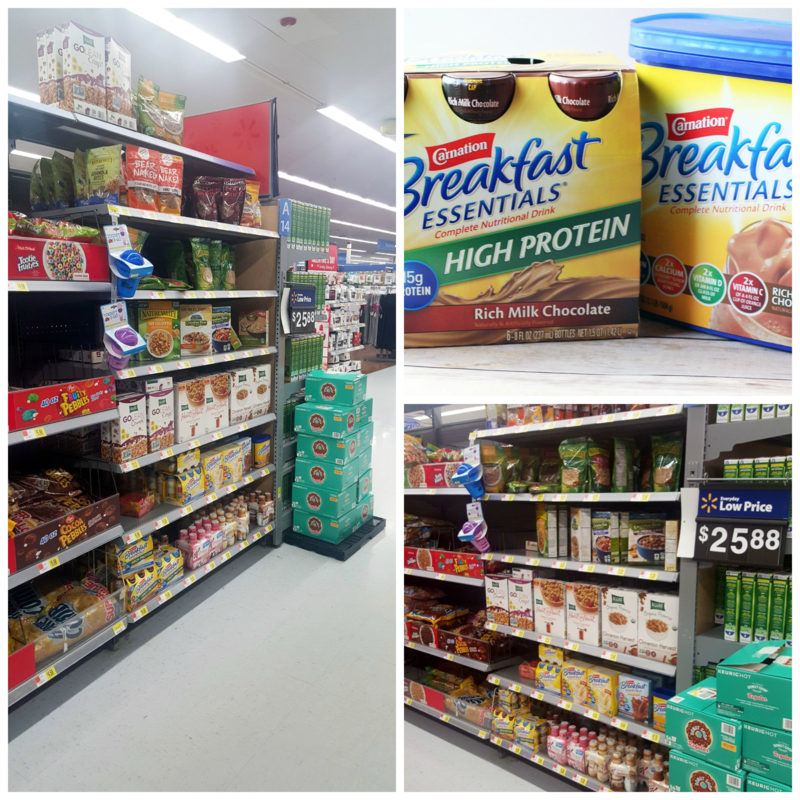 You can get Carnation Breakfast Essentials® in a variety of flavors (I picked mine up at Walmart, where I can literally find everything I need), so the options are endless. 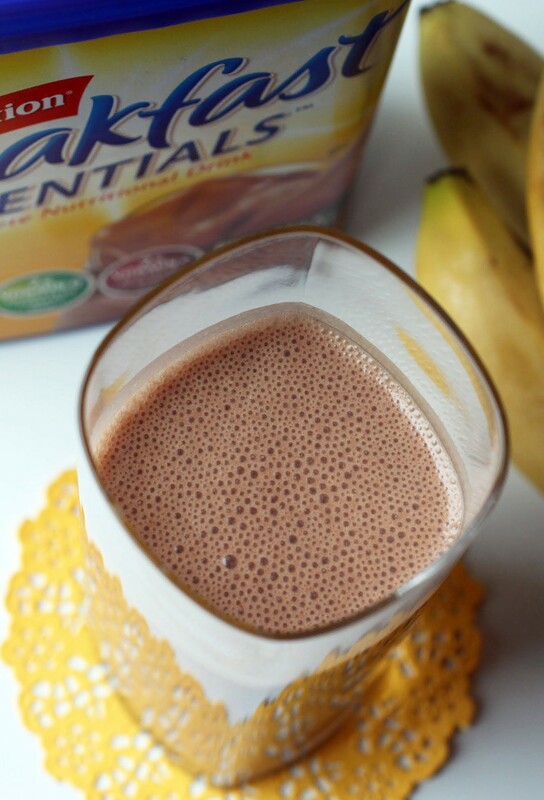 Personally, no morning for me is complete without chocolate, and adding frozen banana chunks and creamy peanut butter just makes everything wonderful! The key to a good day is starting it off right. I like to do that with exercise and a quick yet nourishing breakfast. What about you? How do you start your day? Share your tips below. Here’s to a great start to an even greater week! In a blender, combine all of the ingredients, pulsing until completely smooth. Note: I like to put mine into a to-go cup and take it to work. Yep, my caramel apples, so lovingly planned to go up today for the first day at school, tanked. See, I had this massive migraine yesterday and I tried (smarty that I am) to make caramel apples while lights were flashing in my field of vision and my head was pounding. So, yeah. Caramel apples for another day! Something to look forward to, right? In the meantime, there’s this cake. I love this cake. 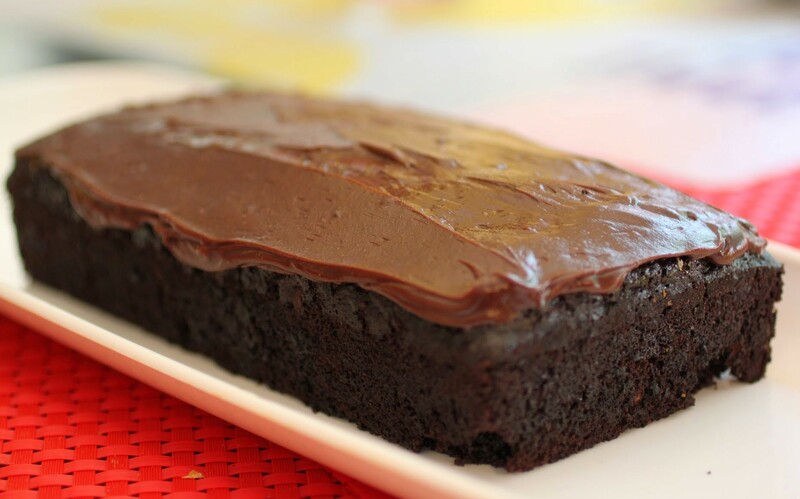 It’s vegan and gluten-free, but it’s so incredibly delicious. Sounds wrong, I know, but it’s true! Whenever I don’t know what to make for breakfast, I usually go for a smoothie and chocolate peanut butter is a favourite, but usually with some spinach in it. 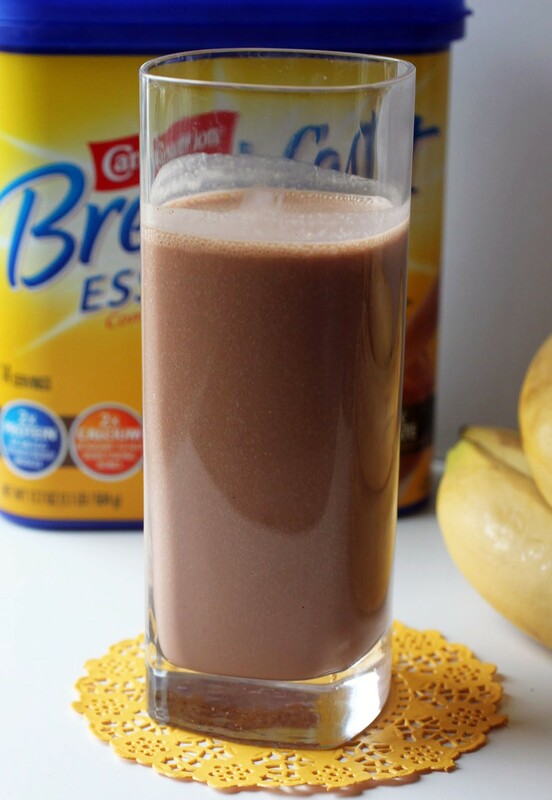 Chocolate definitely belongs in a smoothie, especially when Carnation is involved! This would definitely get me going in the mornings! 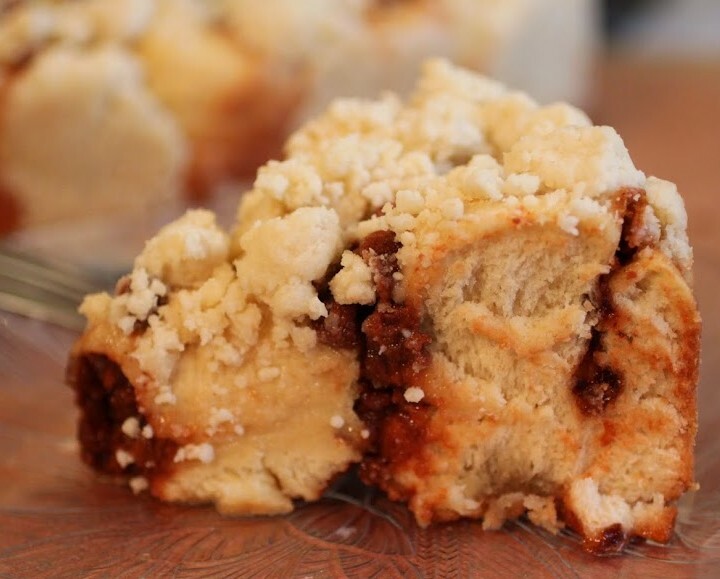 Love the combination of banana and pb in here too…just perfect! Yep. I’ve been drinking Carnation since I was a kid! I’m going to be singing the “carnation instant breakfast…you’re gonna love it in an instant!” song all morning now!! And I will be craving this smoothie until I make it. Awesome! Ha! I love that jingle! Could not agree more. I need both of those in the morning! Hey! We both made smoothies today! 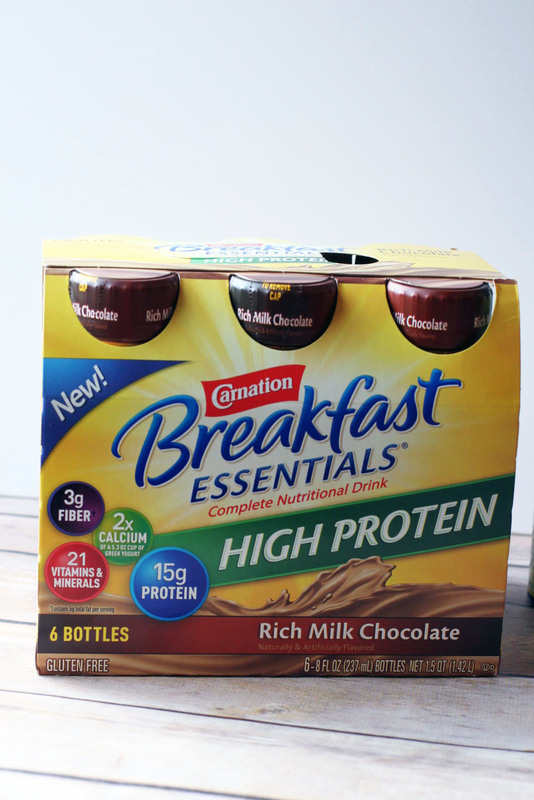 love the Carnation Breakfast Essentials. . I know some friends that live off of that stuff but I have yet to try it! I’ll have to give it a try! The high protein one sounds great! It’s smoothie day! It’s pretty tasty. I’m all about sweet protein first thing! I never use the snooze button either… I just don’t understand the torture either. My husband however uses it 3 times. Daily. I always question, why not just set your alarm back 15 minutes then?! Stupid if you ask me. 😉 Anyways, Yay to smoothies for breakfast! Super quick, and seriously delish, especially this one! 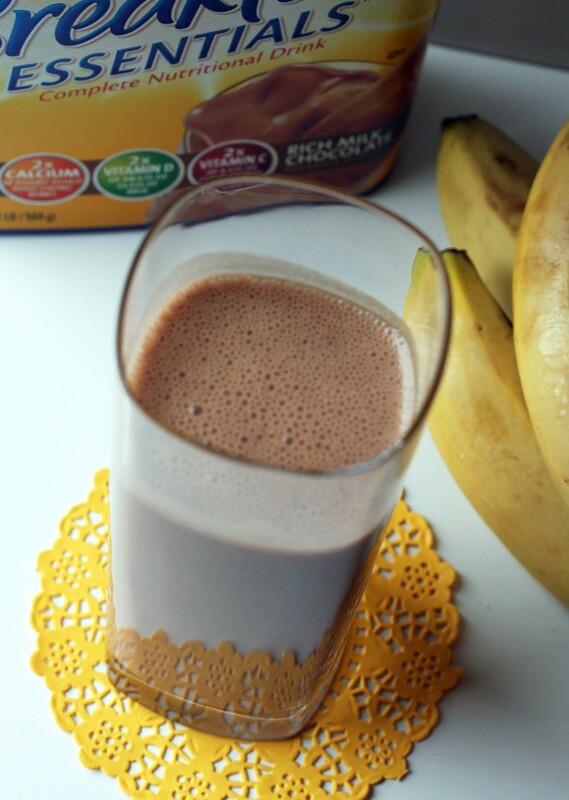 You can’t go wrong with peanut butter and banana (and chocolate if you are anyone but me)! 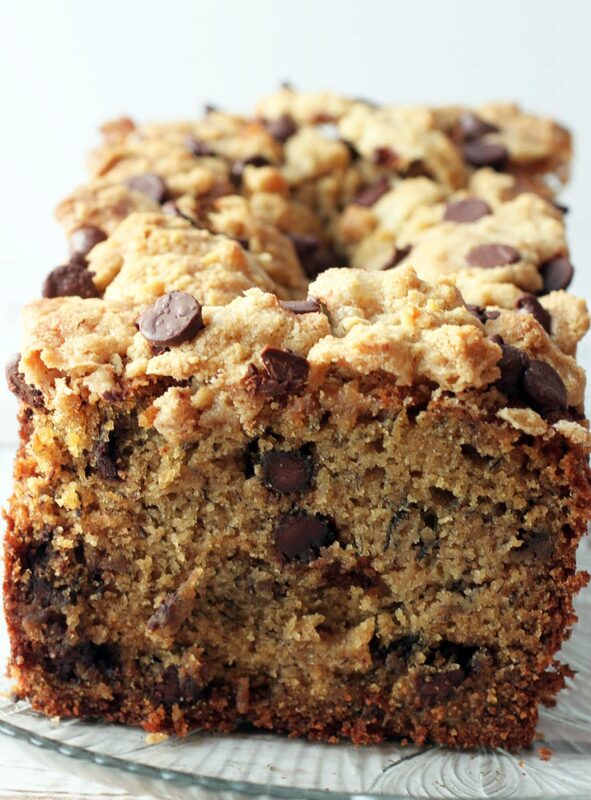 Slurping this in the car sounds like a pretty great way to start the morning! Cheers, doll! Three times? That is snooze crazy. He just needs to get up the first time and avoid the torture! I’m totally into the snooze button torture. I just don’t want to get out of bed. Smoothies are about the only thing I can take first thing in the morning besides fruit. Maybe if I had some chocolate and banana deliciousness waiting for me I’d skip the snooze button and jump out of bed! Hey, to each her own. I just can’t do it. Snooze seems so painful! Everyone has different morning habits. No shame in warming up to the food slowly! And I’m trying yours, Mira! It’s so tempting to eat junk for breakfast. So this helps keep me honest! You can never go wrong with this combination! sounds so good! I’ve been having so many smoothies lately, and I’m always looking for another to add to the mix. This looks great and I love the added protein. I like a rotation too, Amanda!